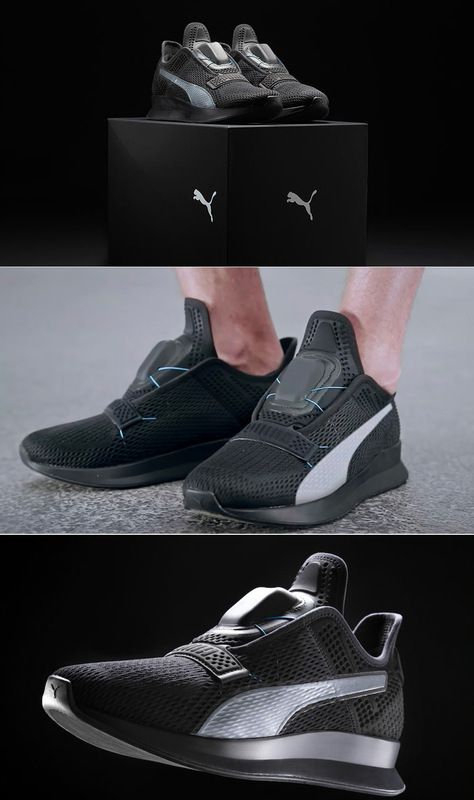 Puma is ready to take on the second-generation Nike HyperAdapt sneaker when they’re released later this year, with their very own self-tying shoes, called “Fi” (Fit Intelligence) that can adapt to the wearer’s foot when they swipe a module on the shoe’s tongue. How does it work? An embedded micromotor activates a pair of cables that tighten the shoe as needed, and the tightness can also be adjusted through a smartphone app, while micro adjustments can also be made using an Apple watch. Read more for a hands-on video and additional information. The shoes can be charged using a Qi wireless charging pad and when fully powered, you’ll be good for about 5 days of use. Want to get your hands on these early? Join the Fi Beta Test program through PUMATRAC, which is PUMA’s training app available now on the App Store and Google Play. “PUMAtrac users will be alerted when the best testing period starts in their location. The final consumer show will go on sale in 2020 and retail for approximately $330,” reports Interesting Engineering.